A lot of times in our life, we tend to get caught in the routine, work pressure or stress from studying so much that we forget to relax. The term "relax" becomes a luxury and we never have the time to plan anything. And even if we do begin planning on the only weekend off that we get, it usually ends up getting cancelled since everything seems so far away, pricey or impossible to travel to. Familiar with these instances? If that's the case, don't worry because we've got you! If you live anywhere close to Haryana, here's a place you can visit with your family or friends, the perfect weekend getaway that you don't have to worry too much about! Morni Hills is a laid back hill station located in Haryana. In fact, it is the only hill station of Haryana! It welcomes you with lush greenery that rolls all around the region. You can even witness the Shivalik ranges of the Himalayas surrounding the Morni village. 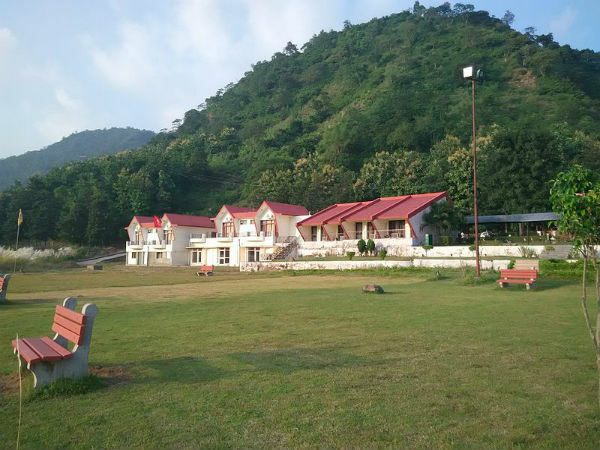 In fact, it is the only hill station of Haryana, therefore, it attracts tourists and visitors mostly from the neighbouring places of Delhi, Chandigarh and Punjab. Morni Hills is located in Panchkula district at an altitude of 4,157 ft, and is at a distance of just 42 km from the capital city of Chandigarh. Apparently, the word Morni is derived from a Queen who used to reign the region. It is a great spot for trekking, rock-climbing and even just nature walks. The hilltop is pine-clad with other trees such as oak, jamun and jacaranda trees filling the slopes. Since the climate isn't very cold, the pine trees have small and cute-sized cones! Apart from these activities, the Morni Hills is home to a large number of different bird species making it a haven for bird-watchers as well. Almost synonymous with Morni Hills, Tikker Taal is a beautiful place that houses two man-made lakes called Chota Taal and Bara Taal. These lakes are interconnected, but separated by a hillock. Tikker Taal gives a spectacular of the Morni Hills. The place has relatively cheap accommodations, therefore, it is a perfect getaway when you're on a budget. Built around the 17th century, the Morni Fort is a humble but huge fort perched right on top of the hills. View of the village is absolutely breathtaking from this point. Although the fort is in ruins, it has been restored for tourists and still has the rustic ancient feature that we all love in places of historic significance. Nada Sahib Gurudwara is especially a beloved place to visit for the Sikhs. It is believed that Guru Gobind Singh, the tenth Sikh Guru, rested at this spot before heading towards Anandpur, subsequent to the victory at Bhangani in 1688 AD. The river Ghaggar-Hakra that flows beside the Gurudwara simply elevates the spiritual and blissful feeling eluded by the entire place. The adventure park of Morni Hills offers adventurous yet safe activities such as zip line, climbing nets and a Burma bridge. This was implemented by the Government of Haryana in order to increase tourist interest of this place that still has a lot of potential for growth. Since Chandigarh is located just 42 km from Morni Hills, the ideal way to get to the place is by first reaching Chandigarh. The Chandigarh Railway Station is connected to all major cities like Delhi, Kolkata, etc. From here, a taxi or car ride of just an hour should reach you to the Hills. Buses are also available from the Chandigarh Railway Station. Since summers are quite hot, October to April are the best months to visit Morni. The temperature is cool and enjoyable during the winter months.